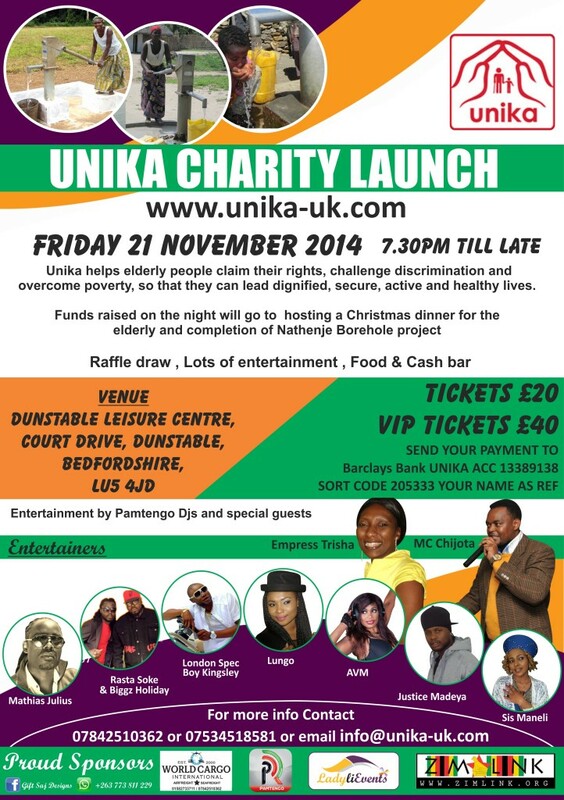 UK based charitable Organisation ‘Unika’ aimed at building a socially inclusive society where all people feel valued regardless of individual differences will be officially launched on November 21, at Dunstable Leisure Centre in Luton Bedfordshire United Kingdom from 1930 hrs till late. The red – carpet event, expected to attract a cross -section of people, will be graced by the Mayor of Luton Borough, Cllr Mohammed Farooq as guest of honour. 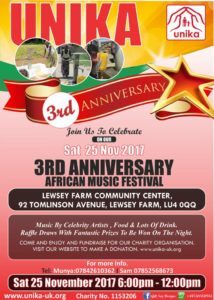 The event itself will be braced with lots of entertainment by Pamtengo Djs and live performances by UK based artists such as Londonspec, Boy Kingsley, Pamtengo Radio Dj/ singer and songwriter, Lungo of the Washaa fame and Gospel sensation and Pamtengo Radio Presenter, Sis Maneli. Also performing on the night will be the Multi-talented Reggae Superstar, Mathias ‘Matty’ Julius, Upcoming Malawian Reggae star, Justice Madeya, AVM and the Ugandan duo, Biggyz Holiday and Rasta Soke. The night will obviously be highly spiced up by popular radio personality compere, Tichafa ‘Tich Mataz’ Matambanazo flying from Harare who is expected to grace the night as special guest. 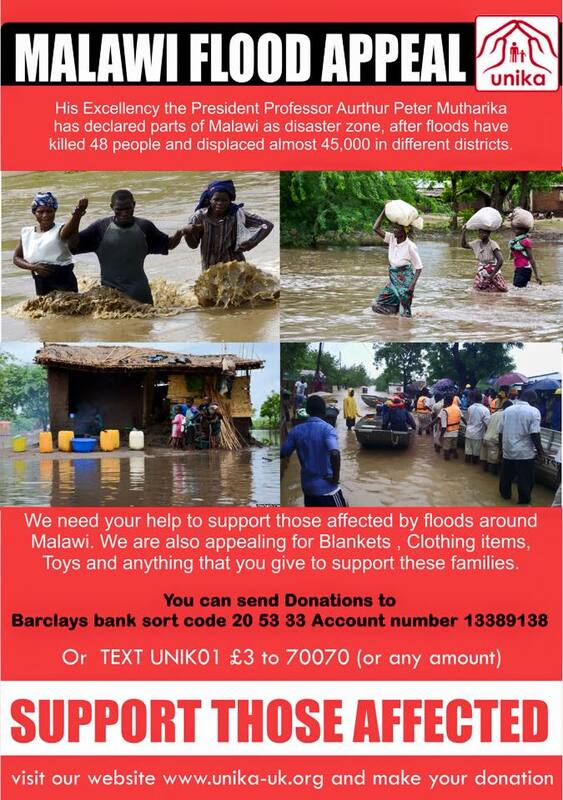 The occasion will also have the Officials from the Malawi High Commission in attendance. Munyaradzi ‘Wordplay’ Usuwana, a young gifted poet better known as ‘The Wordplay Poet’ on the Poetry circuit whom uses rhythm and acronyms to create inspirational messages. will also be yet another inspiration of the night. Also featuring highly on the night will be the Raffle draw, with lots prices sponsored by Klassic Designs, Victoria Kitchen, World Cargo International just to mention a few amongst other sponsors. 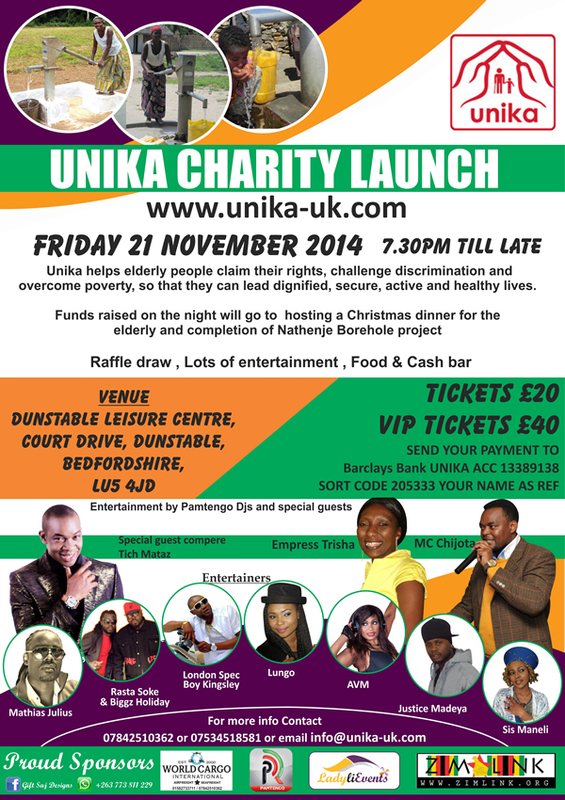 To complement the occasion on the night, Unika will provide Buffet dinner served at £20 only a ticket and £40 for VIP, all inclusive. There will also be Cash bar provided. 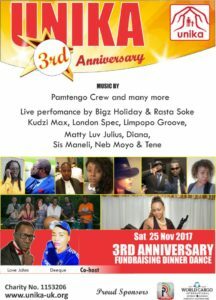 The event’s Director of Ceremonies will be Pamtengo Radio Personality and broadcaster, MC Chijota alongside fellow Presenter Empress Tricia. Proceeds of the launch will go to hosting a Christmas dinner for the elderly and completion of Nathenje Borehole Project in Malawi. ‘’Our aim is to build a socially inclusive society where all people feel valued, their differences respected and their basic needs met so they can live a dignified life,” pointed out Sajanga who also owns the conglomerate of World Cargo International, Pamtengo Radio and Wakachere Limited. ”It’s not right that any one should suffer such horrible loneliness especially when they could be among friends. So we are here to offer that friendship,” said the Unika Boss. For bookings to purchase tickets, people should do bank transfers and then endorse their names as reference. 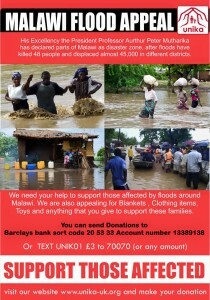 Unika Charity Banking details are available on the flyer attached to this article.